Thanksgiving is my favorite holiday. I love when the entire family gathers to eat, drink, fight, and share good conversation. And, let’s face it, who doesn’t like all the leftovers? Thanksgiving at my home is pretty traditional: Classic roasted Turkey, oven roasted vegetables, stuffing, and assorted pies. But, my all-time favorite food for Thanksgiving is roasted butternut squash. 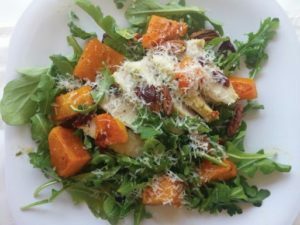 Butternut squash is so simple to make and I typically double or triple the recipe to make sure I have plenty of leftovers. So, should you have any leftover turkey from your Thanksgiving feast, below is a super simple elegant recipe which makes use those yummy leftovers. Happy Thanksgiving from your friends at Soriant Solutions! We are so thankful for all of your support. We hope you have a safe and healthy holiday.